A warm welcome to Sheridan! Now you can download Sheridan's design e-Books from our Wire Jewelry Making Tutorial Instant Download website. She also shared a FREE Wire Jewelry Making tutorial too so do check it out soon! Sheridan had just joined us as guest artist and she decided to join the current promotion we are having right now: up to 50% off most of the jewelry making tutorials on the website, and also opt-ed in for 20% further deduction retreat. That said, if you are getting her tutorial right now it would be 50% off normal price, and if you check out 3 or more of her tutorials (or combination of other artist's works), you can enjoy 20% further deduction for items marked with % sign, we encourage you to buy more with less! This is an advanced level project, Joslin expect you came with some basic knowledge about wire jewelry making. 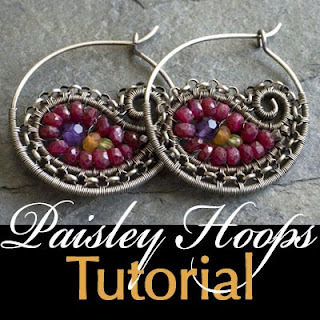 In this tutorial, you will learn how to create meticulously crafted wire-wrapped hoop earrings embellished with a bejeweled paisley design.